In my attempt to eat as many raw, fresh veggies as I can each day I have found that I love breakfast burritos. It is so easy to roll up some egg whites with a bunch of veggies and be on my way, and did I mention they are delicious!? Egg whites are awesome because they are high in protein, low in fat and calories, they taste good, and they cook fast. There are so many variations you can make on this healthy burrito, but I’ll just write down what I put in this one. Other toppings could include: avocado, onion, squash, or zucchini. Enjoy! 1. Wash and prepare all of your vegetables. 2. Heat a skillet on medium-high heat, spray with cooking spray, and saute the bell pepper and mushrooms for 1-2 minutes, until soft. Remove vegetables from pan, reserving on a plate and return pan to the stove top. 3. Add your egg whites, sprinkle with a little salt (if desired), and cook for 1-2 minutes until done. 4. 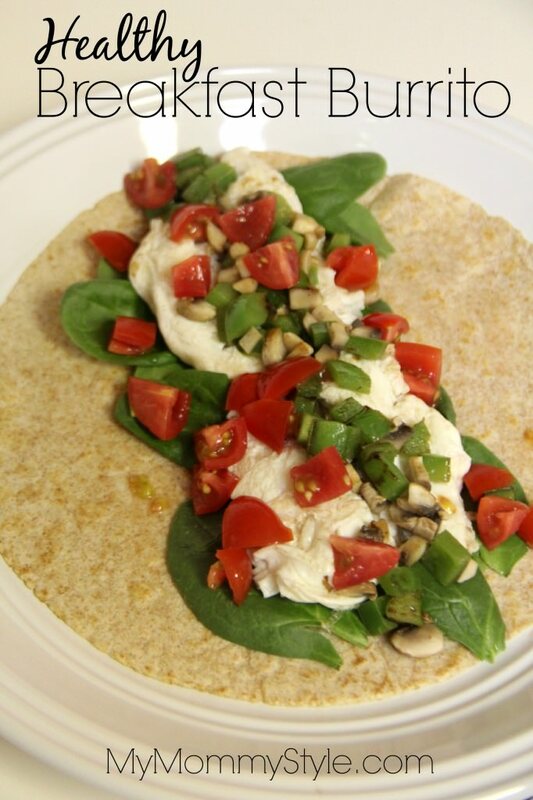 Place the spinach in the middle of the tortilla, top with the egg whites, sautéed vegetables, and chopped tomatoes. Add the salsa.